Ever wondered which diamond size to choose for your partner? Have a look at this video for a better idea! 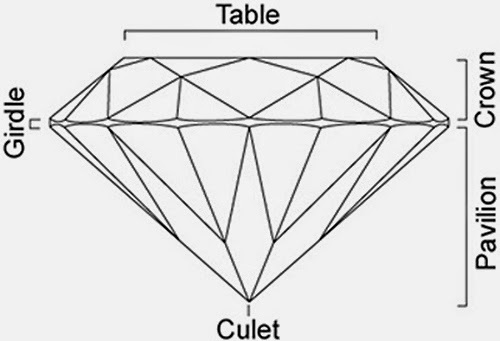 The table of the diamond is the largest facet of the diamond; the flat top surface of the diamond. 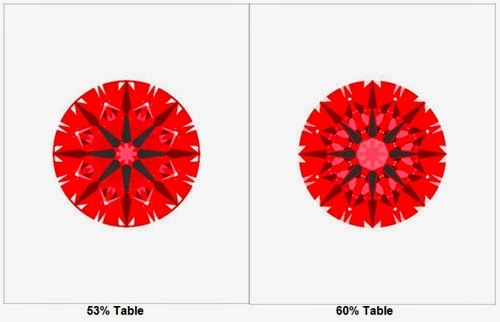 The Table % of the diamond is calculated by dividing the width of the table by the diameter of the diamond (taken from each end of the girdle) multiply by 100. Diamonds with a larger table will appear bigger than diamonds with a smaller table, hence having a larger spread. 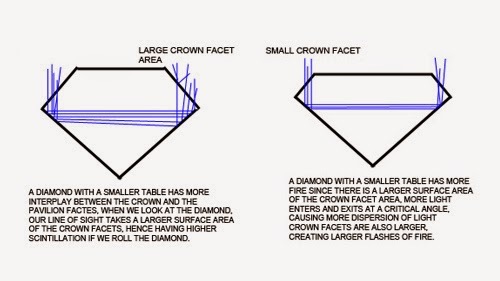 A diamond with a smaller table has more fire as there is a larger surface area of the crown facet area, where more light enters and exists at a critical angle, causing more dispersion of light. Diamonds with a larger table appear brighter. This is due to the contrast differences in the diamond. 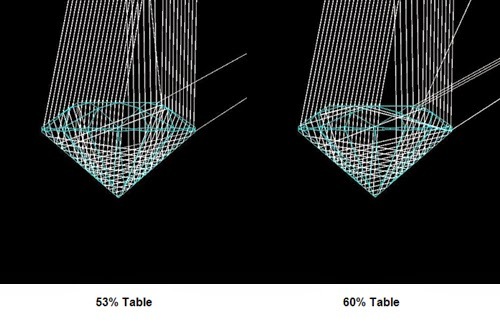 A smaller table appears to have thicker arrows of contrast, leaving the diamond to be less bright. 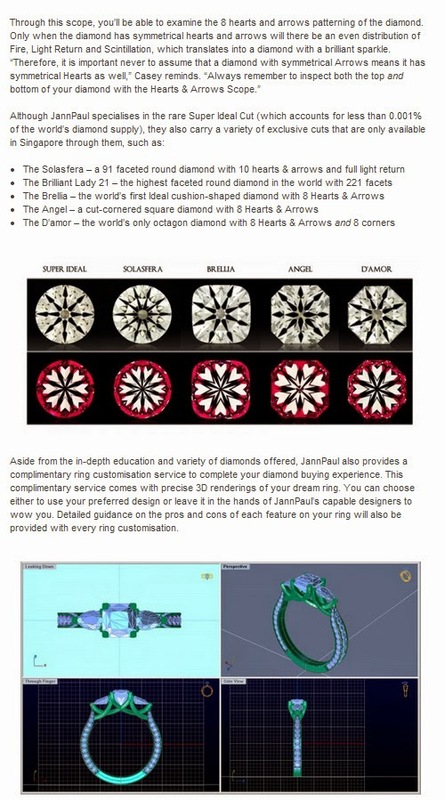 A diamond with a larger table has smaller sized arrows of contrast, leaving more space of brighter areas (more light return), resulting in a brighter diamond. Diamonds with a smaller table produces a higher amount of scintillation. Since there is more interplay between the crown and the pavillion facets, we will see more patterned scintillation and sparkle scintillation. 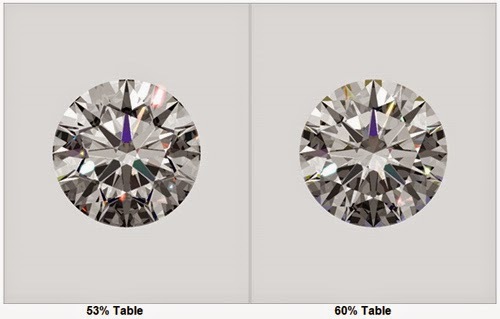 Diamonds with a larger table produces a lower amount of scintillation due to the lack of interplay between the crown and the pavillion facets, we will see less patterned and sparkle scintillation. With all this in mind, what kind of table diameter should I go for? The ideal range would be 53-58%. Diamonds are all about finding the perfect balance of brightness, contrast, fire, scintillation and spread. However, a diamond with a larger table appears to have more CON's than PRO's. When the table reaches too high a level, light leakage is apparent under the table. When a ring is worn, dust and dirt may be seen right through the table, leaving the diamond appearing even less bright than it should. When picking a diamond in the ideal range of 53-58, look to the other angles and minor facets such as the stars and lower halves, these would start to have a higher impact of how a diamond is performing. For ring collection, resizing, polishing or engraving, an appointment is not needed. Please feel free to drop by anytime during our office hours, from Monday to Friday (10.30am - 7.30pm). 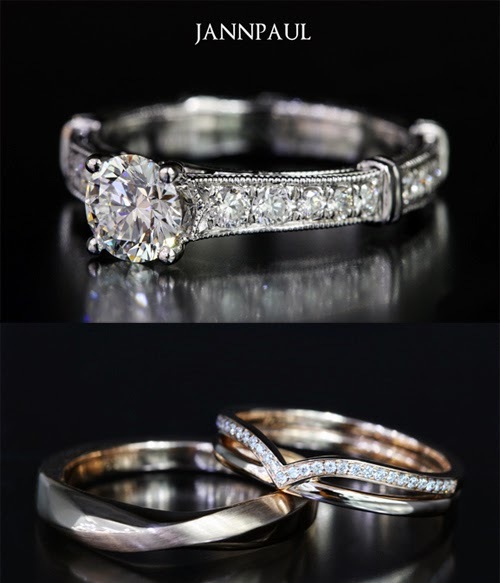 For ring resizing, replating or engraving services, it will take about 2 to 3 weeks . JANNPAUL provides 12 months interest free monthly installments for UOB, DBS, Standard ManHantan Card and Citibank credit cardholders. We are very flexible with our payment methods; customers may split payment in cash and installment, for example, 50% in cash and 50% installment. 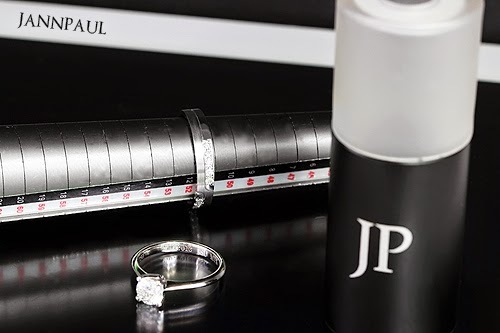 This time I would like to share for you how to know your girlfriend's ring size which is one of the problems facing any man - is discovering what size of the ring can fit. 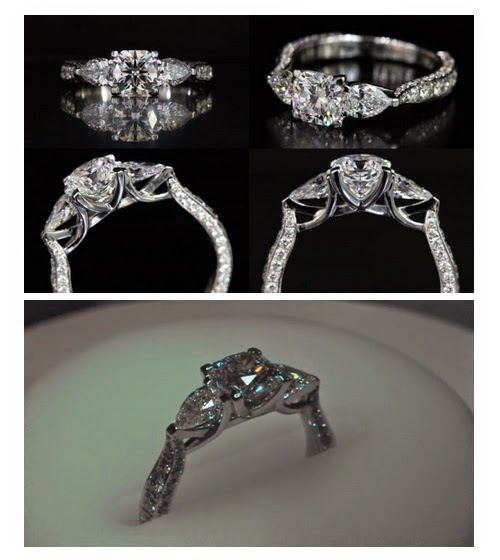 Check out her jewelry box for a ring you can borrow or take a tracing, as described above. Where possible take one that you know she wears on her ring finger, in case you take one that she wears on a different size finger – or is one that doesn’t fit her any more. Take a piece of string when she’s asleep and gently wind it once round her finger. Make sure that the string is not wound round too tight and that it can be moved gently over her knuckle. Take hold of it at the point where it meets the end of the string and then gently remove the string from her finger, whilst keeping hold of the meeting point. Make a pen mark or cut the string length at this point. Measure the short piece of string to figure out her ring size. This trick can be difficult to achieve if she’s a light sleeper. Plus the sizing may not always be totally accurate. However, it can provide a guideline. This next trick is a good way of checking whether your string measurement was correct. Buy an inexpensive but pretty costume jewelry ring in the size of your measurement. If however, you haven’t been able to do the string trick, then aim to buy a costume ring that is a size 6 – since this is the average ring size for a girl (or, if you suspect that her fingers are larger than the average girl, get a larger size) Next, pretend that you’ve either a) found it lying in the street b) won it in a competition, or c)say that your friend bought it as a present for his girlfriend but it doesn’t fit her. Offer the ring to your girlfriend. Hopefully, she’ll like it enough to try it on and you can see how well it fits her finger. This trick can also be a good way to check out her taste in jewelry – for example: try and get a costume ring in a similar style to the one you are thinking of buying her as an engagement ring. 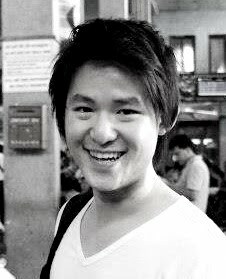 Get help from your girlfriend’s mother or a good friend, who can keep a secret. Ask them to include a window shopping trip to a jeweller and try on some rings, the next time they go shopping with your girl friend. This is a good way to discover not just the ring size but your girlfriend’s preference for ring styles as well. let your girlfriend in on part of the secret by suggesting that she try on some rings whilst you are out shopping one day. Now she’ll probably guess what you’re planning but won’t know when or where. However, at least this way, you’ll know her exact ring size and have a better idea about her likes and dislikes. Plus, by her reaction to the jewelry trip, you’ll get a good idea as to whether she’s likely to accept your eventual marriage proposal. So I'll give you this ring sizing chart link http://en.wikipedia.org/wiki/Ring_size that gives you the diameter of each ring size and the corresponding code letter for each size. Use this to help you determine your girlfriend’s ring size , once you have managed to obtain a tracing from one of her rings, or you have one of her rings to compare.